Note: if you are not represented by a lawyer, click here for more information. Pursuant to Local Rule 5-4.1 and Local Criminal Rule 49-1.1, electronic filing is mandatory for attorneys in all civil and criminal cases in the Central District of California. All documents must be filed electronically, unless exempted by Local Rule 5-4.2 or Local Criminal Rule 49-1.2, using the Court's Case Management/Electronic Case Filing (CM/ECF) system. Currently, only attorneys are required to file documents electronically. If you are not represented by a lawyer, you may continue to file documents in paper; however, you may also be eligible to apply for permission to file documents electronically in a particular case. See Local Rule 5-4.1.1, and click here for more information. The Case Management/Electronic Case Filing (CM/ECF) system is the federal judiciary's comprehensive case management system for all appellate, district, and bankruptcy courts. CM/ECF allows courts to accept filings and provide access to filed documents over the Internet. CM/ECF keeps out-of-pocket expenses low, gives concurrent access to case files by multiple parties, and offers expanded search and reporting capabilities. The system also offers the ability to update dockets immediately and make them available to users, to file pleadings electronically with the court, and to download and print documents directly from the court system. 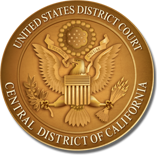 To file documents using CM/ECF in cases pending in the Central District of California, users must obtain a CM/ECF login and password from the Central District of California. Currently, each federal district court that uses the CM/ECF system requires a separate login and password. Attorneys: Request a CM/ECF login and password. Public Access to Court Electronic Records (PACER) is an electronic public access service that allows users to obtain case and docket information from federal appellate, district, and bankruptcy courts via the Internet. PACER is provided by the federal judiciary in keeping with its commitment to providing public access to court information via a centralized service. Docket information cannot be obtained over the phone from the clerk's office. PACER provides access to dockets (case information) via the Internet for a fee of $0.10 per page. To establish a PACER account, contact the PACER Service Center (800/676-6856) or register online. If you experience difficulty with your PACER login, contact the PACER Service Center at 800/676-6856.